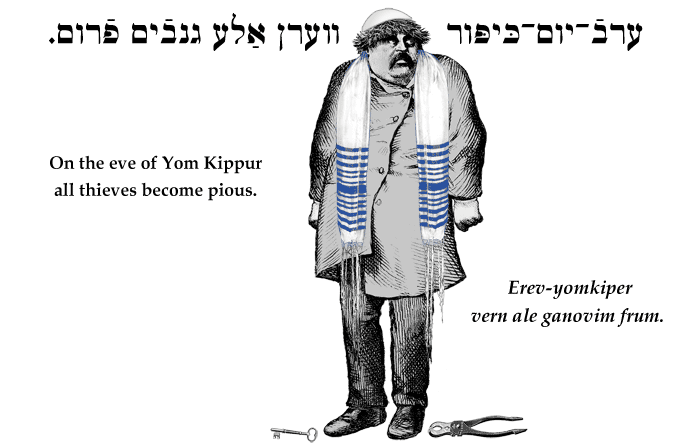 Yiddish Wit: On the eve of Yom Kippur all thieves become pious. ערבֿ–יום–כּיפּור ווערן אַלע גנבֿים פֿרום. Erev-yonkiper vern ale ganovim frum. On the eve of Yom Kippur all thieves become pious. SOURCE: Bernstein, Jüdische Sprichwörter und Redensarten. Yom Kippur, the holiest and most solemn day in the Jewish calendar, is dedicated to atonement and repentance.